“We have indications that the Russians intend to supply heavier and more sophisticated multiple-launch rocket systems in the very near future,” said Army Colonel Steve Warren, a Pentagon spokesman, adding that the weapons were in the over-200mm range. “We believe that they are able to transfer this equipment at any time, at any moment,” he said. Warren said it was unclear whether Russian operators of the rocket launchers might cross the border as well but he said there been indications of Russian operators of other systems going over. A multiple-launch rocket system is a wheeled or tracked vehicle mounted with multiple tubes capable of firing a half dozen or more guided or unguided rockets in quick succession at targets scores of miles (km) away. The rockets are generally 100mm to 300mm, with those over 200mm in the heavier-caliber category. “We’re very concerned with the quantity and the capability of weapons flowing from Russia into the Ukrainian separatists’ hands,” Warren said. “There has been a continuous flow over the last several weeks of weapons and equipment from Russia to Ukraine,” he said, noting that the “most egregious example” was a column of more than 100 vehicles crossing the border. The Pentagon’s assessment that a transfer of heavy weaponry was imminent came as Russian authorities accused Ukraine of firing a volley of mortar rounds across the frontier into Russia on Friday while a group of investigators was in the area assessing reports of cross-border shooting. A Russian security official said up to 40 mortar bombs fired by Ukrainian forces fell in the Russian province of Rostov near the border where Ukrainian government forces are fighting pro-Russian separatists. There were no reports of injuries. Warren also said the United States continued to see Russian artillery on Russian soil firing on Ukrainian military positions inside Ukraine, a practice that has been going on for several days now. He said he had no information about Ukrainians firing across the border into Russia. Warren said the Pentagon continued to see a “continuous slow and steady buildup” of Russian forces along the border. He said the number was still in the 10,000- to 12,000-range, but was now “towards the high side” of that range. 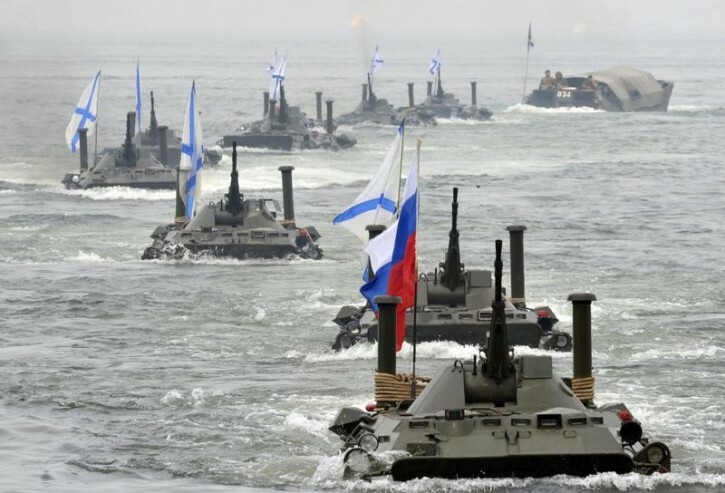 Others officials estimated the size of the Russian force had grown larger. U.S. Ambassador to NATO Douglas Lute told a security forum in Aspen, Colorado, there were now some 15,000 Russian troops amassed along the Ukraine border. “We’ve repeatedly called on the Russians to withdraw force from the border and to help de-escalate,” he said. hitler repiting chamberline peace in our time repiding buisnes as usoel h h j.